Settings: MakerWare .3mm/low with support-reducing custom slicing profile, on a Replicator 2. We printed each one in a different color with scraps from home and work so that they would be easy to identify. Each model was scaled by a constant that measured the openness of its design, so that together the models would look like a matching set. The wireframe designs were made using Mathematica, MeshLab, and TopMod. Everything in this paragraph is described in detail below. 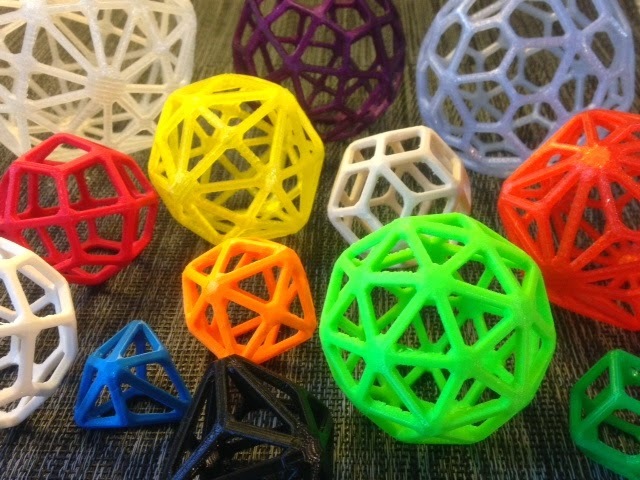 Technical notes, nomenclature flavor: Which polyhedron is which? Every face of a Catalan solid is the same non-regular polygon, and the prefix of its name describes the kind of face that it has. Technical notes, modeling flavor: The following is the workflow used to obtain these models. Most of this was described in Day 194 but we repeat it here for completeness and to insert the scaling step that we added in Day 195. We'll walk through with the Pentakis Dodecahedron as our example. UPDATE: This set of models was "Featured" on Thingiverse on April 22, 2014, hooray!